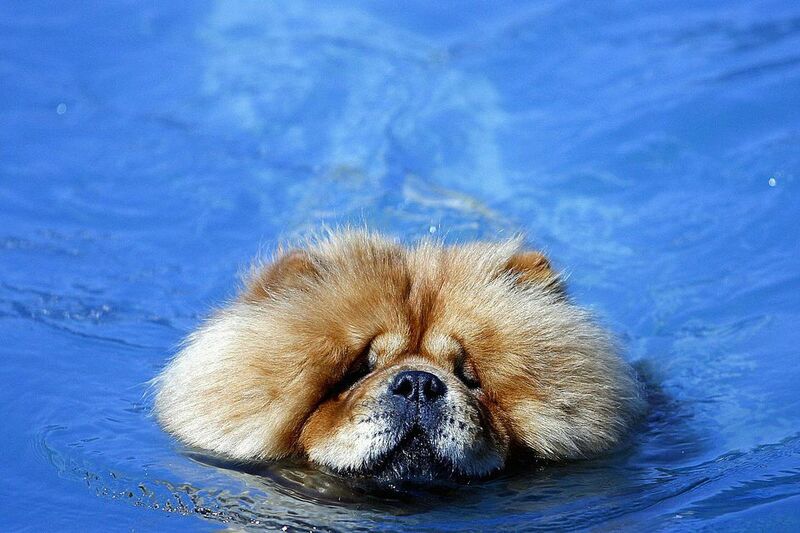 Chow Chows have such thick, heavy fur they can easily become waterlogged and drown. Puppy swimming comes naturally, but puppy drowning happens just as easily and requires first aid to save your puppy's life. Many puppies leap before they look, or simply fall into the swimming pool, hot tub or break through ice on the lake and can’t get out. Dog paddling may be instinctive but they can still drown if they can’t climb out and get too tired to float. Some puppy breeds adore the water but others have a hard time staying afloat. For instance, Labrador Retrievers especially love the water. Puppy breeds with heavy coats such as Collies become waterlogged and tend to dislike puddle jumping. Heavy-bodied breeds like Bulldogs have trouble staying afloat and actually could sink and be unable to get out of the pool. All pets are at risk but especially small breeds and puppies are most prone for drowning. Their inexperience, curiosity, and fearlessness prompt them to explore but they may be unable to climb out of even small bodies of water. The steep sides of backyard pools and hot tubs prove particularly dangerous during the summer. Wintertime risks happen when the pet walks out onto the ice-covered pond or river and falls through. A puppy’s light weight means he can travel far away from the bank before the ice cracks, and you won’t be able to easily reach him for rescue. Pool safety is important for children as well as puppies. Most backyard pools have steps to get out along with a shallow end. Teach your pup how to find these easy exits. For instance, place a large visual marker such as a planter near the shallow end or steps. Then when King does his doggy dive, have him paddle toward the planter to show him the steps. Praise him when he finds the way out. Never leave pets unsupervised around the pool. Does your pup enjoy boat rides at the lake? Camping and spending time with furry friends on the water can be loads of fun, but pets easily lose their footing on slick decks. A dog that pinwheels off the boat racing at forty miles-per-hour needs lots of luck to survive and swim to shore. Even if he manages the trek, he may become lost on the beach so identification tags and microchips are a must before such adventures. Provide double-sided rubber mats on boat decks for more secure pet footing. A halter and tether also help keep pups secure on board. If your furry friends absolutely must go with you on the boat, provide safety life vests for pets. You can find products at specialty pet stores or online outlets for the ultimate in pet water wear. If the worst happens and you find your pup floating and not breathing, minutes count. Sometimes it’s not obvious the dog has drowned if you find him drifted onto the shore, so check the rims of the eyes or gums. Lack of oxygen turns these tissues blue or gray instead of the normal pink. Before administering first aid, get your puppy out of the water but keep yourself safe. Unless water is very shallow don’t get in the water yourself. Stay calm and find a pool skimmer, rake, fishing pole, branch or another long reaching device to hook the collar and fish your baby dog out of the wet. When the pup is small enough, you can hold him upside down by the hind legs or hips and give him a good shake to help drain water from the lungs. If he’s too big to pick up, place him on his side with his head lower than his tail. Put the heel of your hand in the dip behind the last set of ribs, and thrust up toward his head three or four times in a modified Heimlich maneuver. Wait a couple of seconds to watch for water to come out, and repeat one more time to try and expel the water. Sometimes that’s all that’s needed to jump-start the breathing. Water absorbs very quickly in the lungs. If nothing comes out don’t continue the maneuver. Some pets experience “dry drowning” when fear or cold temperatures make the airway into the lungs to spasm. There might not be water in the lungs but the puppy still can’t breathe. When the heart has stopped it’s very difficult to get it going again without specialized veterinary equipment. But you can save your puppy’s life with rescue breathing. Even when you’re able to resuscitate your pet at home, it’s a good idea to have the veterinarian examine your pet. Puppies that have been in the water especially during winter weather can develop hypothermia — body temperature below normal. They may need help to re-warm. And pups that never stopped breathing but were fished out of the lake in a near-miss also should be checked. Contaminated water that’s swallowed or inhaled can make pets sick, and water absorbed into the lungs may cause a delayed reaction. Please, pet-proof pools and other water adventures to prevent tragedies all year round. Supervise your water-babies so cooling off during the summer stays safe and wintertime play won’t be risky business. Water games should be fun for the entire family.